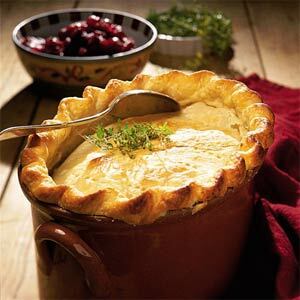 This is one of Da-da's favorites, better than Thanksgiving dinner, because it IS Thankgiving dinner in one pot with a crust. Awesome. Da-da stole this recipe from Grandma Scotty, whose madder than a wet chicken in a chili tornado about it. (What?) Anyway, it's pretty simple. Place alternating layers of gravy, mashed potatoes, peas, gravy, stuffing, gravy, green beans, turkey, gravy and more gravy in your largest, deepest ceramic crock (or equiv. ), fill almost to the brim with more gravy, microwave the whole thing (if it fits) so the core is heated (or warm all the ingredients before assembly). Slap a pie crust on it, cut slits in the crust and bake till it's done (about 30-40 minutes) at 350 degrees. This is so good, you'll find yourself making TWO Thanksgiving dinners so you have enough leftovers. Be sure to make gallons of gravy the day before. Yum.